Our region has a rich Indigenous history, with 16 identified Traditional Owner groups (see Figure 1) and many clan and family groups. The Townsville area also has a large Torres Strait Islander community, and the lower Burdekin is home to significant numbers of people of South Sea Island origin. Indigenous people currently represent around six per cent of our regional population (Queensland Government Statistician’s Office, 2015a). Traditional Owners have by far the longest and deepest connection with country and continue to have a shared living culture with their environment. It is vital that cultural knowledge, which embraces the concepts of intergenerational sustainability and resilience, is not lost and is captured and protected by Traditional Owners for future generations. Incorporating Indigenous people’s traditional ecological knowledge into strategic NRM decision making, and on-ground works, maintains their strong connection to country and also better protects and manages our region’s natural resources. 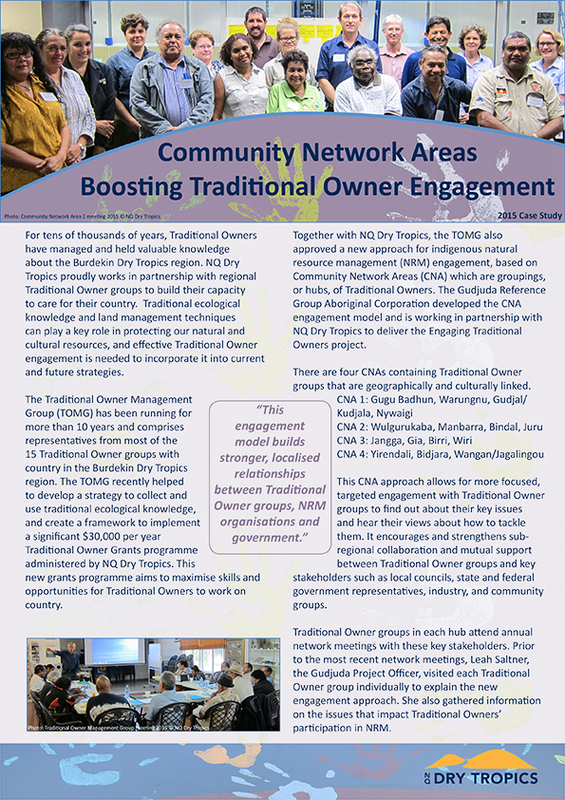 In our region, a Traditional Owner Management Group (TOMG) provides regional indigenous leadership and advice in NRM. Traditional Owners have observed that our region’s Indigenous ‘A Caring for Country Plan’ (2005) remains relevant, although only partly delivered, and the implementation strategies require ongoing support and recognition. The Caring for Country Plan recognises that natural resources are also culturally defined, and articulates strategies that support Traditional Owners to develop their capacity to undertake NRM actions on country. 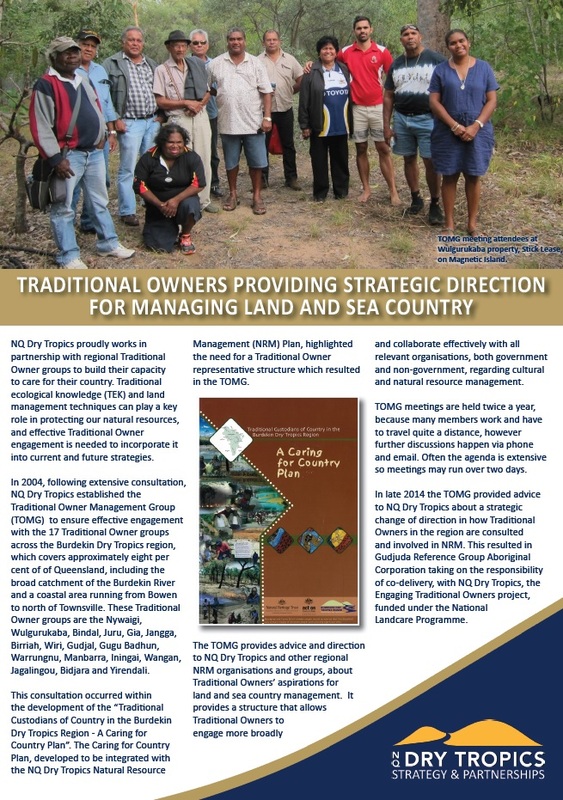 A number of Traditional Owner groups also have local land and sea management plans, which identify the values, issues and actions for NRM on their country. The TOMG identified capacity building in NRM activities as a priority for Indigenous people to improve personal, community and country health and wellbeing. National Native Title Tribunal website. NQ Dry Tropics. (2008). Healthy Land Yarn. Aboriginal Cultural Heritage. Queensland Government Statistician’s Office. (2015a). Queensland Regional Profiles: Indigenous Profile for BDT region. 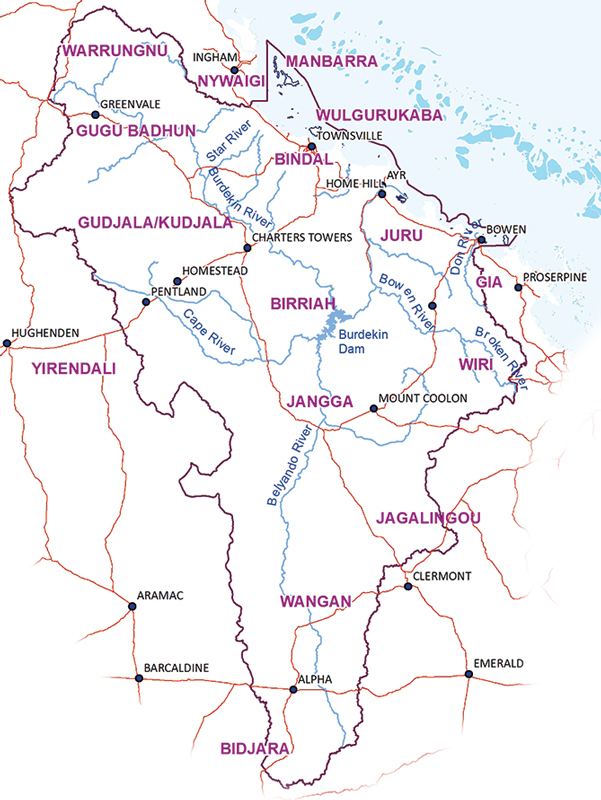 Traditional Custodians of Burdekin Dry Tropics region. (2005). A Caring for Country Plan.